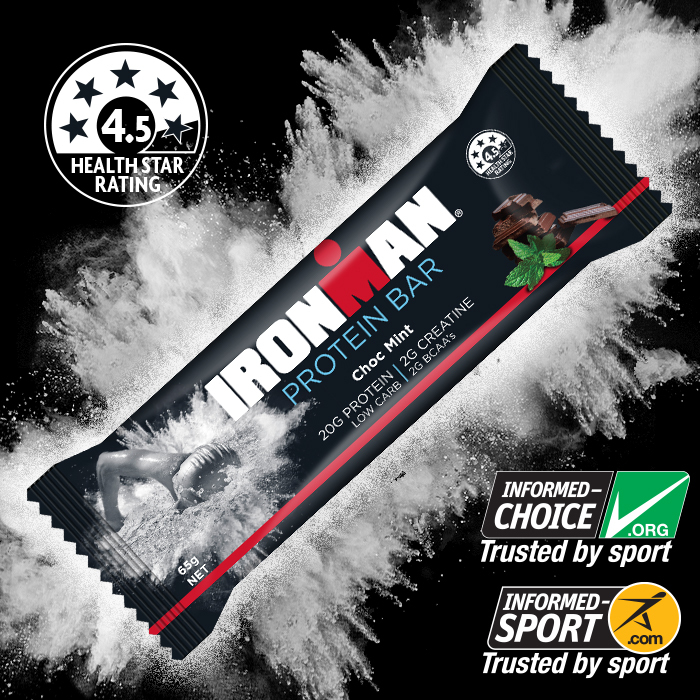 With over 20g of Protein, 2g of Creatine and 2g of BCAA's, IRONMAN® Protein Bars are the perfect snack to help you maximise athletic performance, optimise endurance, and aid muscle recovery. A delicious combination of fudgy chocolate layered with luxurious caramel, and finished off with a sprinkle of dark chocolate crisps. For the chocoholic! A fudgy milk chocolate base sprinkled with dark chocolate crisps, and finished off with a decadent white chocolate coating. The naughtiest of the lot. A fudgy chocolate base topped with refreshing mint, and crispy dark chocolate pieces. A delicious blend of oats, fruits and brown rice syrup that is easy to eat and is full of slow release carbohydrates for sustained energy. Endurance fuel for intense activity. There is no doubting that energy gels are a convenient, compact and easy to carry fuelling option to use during Ironman racing and long training sessions. But, with a huge range of options now available, choosing the right gel to meet your individual needs can feel like a sticky mess. To help cut through the confusion, here are a few key points to consider when it comes to choosing an energy gel. IRONMAN® Energy Bars are the official energy bar for the 2018 IRONMAN® Australia series, and will be launching at IRONMAN® Geelong (Feb 16-18). Working closely with a leading Australian sports dietician, these bars have been formulated to help athletes maximise athletic performance and optimise endurance both on and off the track. Thank you to everyone who came down and visited us at the Noosa Expo. What a great weekend to have been involved in. We would like to say a big well done to all of the athletes who competed over the weekend, and to their families for their epic support throughout the festival. We are going to be at the Noosa 35th Anniversary - Triathlon Multi Sport Festival which is five-day event, celebrating sports, healthy lifestyles, fitness and fun. With an irresistible mix of sport and entertainment coupled with sun, sea and surf in one of Australia’s most popular destinations, Noosa, the event consists of various family, social and sporting activities for everyone to be a part of. The hero event on the final day of the festival is the Noosa Triathlon. IRONMAN® and the “M-DOT” logo are registered trademarks of World Triathlon Corporation. Official Product of the IRONMAN® TRIATHLON. Used here by permission.